The Academy's Kavli Frontiers of Science symposia bring together outstanding young scientists to discuss exciting advances and opportunities in a broad range of disciplines. The format encourages both one-on-one conversations and informal group discussions in which young participants continue to communicate about insights gained from formal presentations and the excitement of learning about cutting-edge research in other fields. By doing so, Frontiers helps to remove communication barriers between fields and encourages collaborations among some of the world's best and brightest young scientists. Annual Kavli Frontiers symposia are held for young scientists in the U.S. and bilateral symposia have included young researchers in the U.K., Germany, France, Japan, China, Indonesia, India, Israel, and South Korea. U.S. symposium participants are selected from among recipients of prestigious fellowships, awards, and other honors, as well as from nominations by NAS members and other participants. In addition to learning about research at the frontiers of fields other than their own, the program is intended to create a network of connections that can be maintained as participants advance in their careers. The KFoS alumni network now contains more than 5,800 past participants, including 12 alumni who have won Nobel Prizes and 236 who have been elected to the NAS (10% of NAS membership) – including 15 who were elected in 2018. The impact of these symposia among the alumni network is long lasting. A 2014 survey of alumni from 2006-2014 found that more than 77% of the alumni have maintained connections made at the symposia, and that more than 19% of the respondents have submitted joint proposals and more than 13% have co-authored papers. In 2005, the Los Angeles, California-based Kavli Foundation, which supports scientific research, honors scientific achievement, and promotes public understanding of scientists and their work, provided a 10-year, $5 million grant. 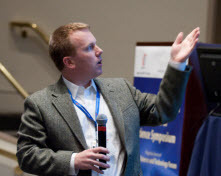 In 2015 the Kavli Foundation renewed its commitment to KFoS with a ten-year $5.5-million grant, providing a solid financial foundation for the program over the next decade, enabling broader dissemination of the content of each symposium, and strengthening opportunities for continued connections between participants over the years. Additional program support is provided by five NAS endowments: the Thomas Lincoln Casey Fund, the Arthur L. Day Fund, the Kobelt Fund, the W. K. Kellogg Foundation Fund, and the Maurice Ewing and Planetary Sciences Fund. The first Frontiers symposium took place at the Arnold and Mabel Beckman Center in Irvine, California in 1989 and established a model for future symposia. 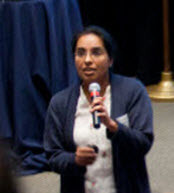 Over the course of a two-and-a-half day symposium, young scientists – drawn from among recipients of prestigious fellowships, awards, and other forms of recognition – attend eight two-hour sessions focusing on topics at the frontiers of disciplines ranging from molecular biology to computer science to astrophysics to chemistry. Each session includes seventy-five minutes of formal presentations targeted to an educated but not specialized audience, and forty-five minutes of questions and discussion. 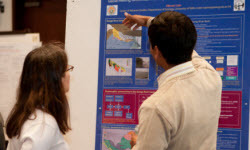 The symposium also includes ample free time for informal discussions, including poster sessions, and meals at which seating is assigned to ensure a diverse group of attendees at each table. These future leaders of U.S. and international science not only discuss ground-breaking advances in the formal sessions, but also take advantage of unstructured time to compare career trajectories, develop contacts within and outside their fields, and develop a broad perspective on cutting-edge research across a variety of fields, and within different countries. The Frontiers symposia continued at the Beckman Center from 1989 to 1994. The program was expanded in 1995 with the first bilateral symposium, which included young scientists from Germany under the auspices of a cooperative agreement signed by the U.S. President and the German Chancellor. Bilateral symposia with young scientists from China and Japan followed in 1998. Each of the bilateral programs is organized in collaboration with an organization in the other country: the von Humboldt Foundation in Germany, the Chinese Academy of Sciences, and the Japan Society for the Promotion of Science. The NAS received additional inquiries for Frontiers partnerships and in 2005 the Indo-U.S. Science and Technology Forum (IUSSTF) agreed to support a biennial bilateral U.S.-India symposium. Bilateral Frontiers symposia were also organized with the Royal Society and the French National Center for Scientific Research to enable those organizations to gain experience with the Frontiers model in preparation for launching their own programs. In 2011, NAS president emeritus Bruce Alberts – one of the first U.S. Science Envoys to the Muslim World – secured funding from the State Department for a three-year, annual Frontiers program with Indonesia. Building upon the success of this US-Indonesia partnership, the United States Agency for International Development (USAID) agreed to continue funding the U.S.-Indonesia program. The requests for international Frontiers partnerships continued, and in 2012 the international symposia – except for Indonesia – were shifted from an annual to a biennial schedule to permit adding other countries. Symposia with South Korea and with Israel began in 2013. The Academy currently holds Kavli Frontiers of Science symposia with five countries and a complete list, with partner organizations and year of establishment is included below. As a direct result of the Indonesian-American partnership, and the network of Indonesian Kavli Fellows, the Indonesian Academy of Sciences – with the support of USAID – created an Indonesian Young Academy, produced a national science agenda and built a national science fund. The Frontiers concept has also expanded to include Frontiers of Engineering symposia sponsored by the National Academy of Engineering (NAE) and its partners in Germany, Japan, China, India and Europe. Additionally, NAS international Frontiers partners have also established their own bilateral international Frontiers programs. For example, the Alexander von Humboldt Foundation currently administers ten Frontiers symposia in science, engineering and the humanities with partners in Israel, Japan, the U.K., China, India, Brazil, and Turkey. And in March 2014, the NAS and NAE partnered with the Brazilian Academy of Sciences – with funding from the National Science Foundation – to hold the first Brazilian-American Frontiers of Science and Engineering Symposium in Rio de Janeiro. Thus, the Kavli Frontiers of Science symposia have become a major instrument in bringing together the best young researchers—the next generation of leaders—in the natural sciences and engineering fields, in the United States and around the world. *Topics presented at the 1989 symposium are included in Science at the Frontier, ed. Addison Greenwood (1989) (National Academy of Sciences/National Academy Press, Washington, DC). Topics presented in the 1991 and 1992 symposia are included in A Positron Named Priscilla: Scientific Discovery at the Frontier, eds. Marcia Bartusiak, Barbara Burke, Andrew Chaikin, Addison Greenwood, T. A. Heppenheimer, Michelle Hoffman, David Holzman, Elizabeth J. Maggio, and Anne Simon Moffatt (1994) (National Academy of Sciences/National Academy Press, Washington, DC).